The Bank of England governor certainly knows how to time his interventions. 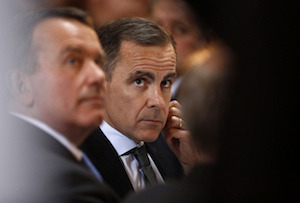 Mark Carney is nothing if not a good self-publicist, making a speech last night on why the Eurozone needs to cosy up fiscally right in the midst of the monetary union’s soul-searching over how to deal with the new Greek government’s demand for debt relief. ‘European Monetary Union will not be complete until it builds mechanisms to share fiscal sovereignty,’ he said in the speech in Dublin in honour of late Canadian finance minister Jim Flaherty. In other words, if the Eurozone was a federal state like the US or Canada, or a devolved one like the UK, there would be no Greece or Spain, where unemployment is 25.7% and 23.9% respectively. Germany and the Scandinavian countries would prop up the struggling south with fiscal transfers rather than bailout loans, as England helps fund Scotland and Wales and west Germany spends on the east (there are EU structural funds for this purpose, but not on the scale Carney and others envision). It’s not a new argument, but there’s no doubt it’s a timely one after the anti-austerity Syriza party took power in Greece on Monday and ECB president Mario Draghi unleashed a €1.1tn programme of quantitative easing last week (which Carney approvingly labelled ‘monetary boldness’). Politically, though, it’s never going to fly – Angela Merkel has enough trouble selling the Greek bailouts to the sceptical German public, let alone full-on fiscal transfers. And edging even an inch further towards a fully federal Europe in this climate is a no-no. But of course Carney doesn’t have to worry about such fleeting concerns - his is an economist's answer to a political question.